The market leading iDrive® LED driver range now includes the 300W iDrive® Thor 16 Silent, which is designed for situations where fan noise is undesirable. 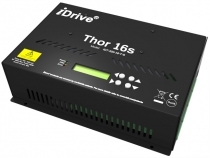 The iDrive® Thor 16 Silent is a multi-output LED driver specifically designed for 12V or 24V constant voltage LED systems. Each output is capable of providing up to 8A with a maximum of 13A (24V) or 26A (12V) across all 16 channels. The Thor 16 Silent can be dynamically configured to use DALI, DMX, RDM, Art-Net 3, HTTP, Art-Osc & sACN dimming protocols, whilst being able to monitor external occupancy and ambient light sensors, without the need for expensive external control systems. Advanced control technology combined with the powerful ieOS operating system enables users to dim the constant voltage fixtures in 8-bit or 16-bit mode, giving unprecedented accuracy for dimming & colour control. Special features include over voltage, under voltage, short circuit and power optimisation functions. The Thor 16 Slient is ideally suited to TV and film applications due to its high frequency, high resolution outputs, which can be dynamically programmed up to 65kHz. IST serves an international customer base, including several multinational lighting companies, providing solutions made with only the highest grade components, to ensure longevity of its LED drivers and LED lighting fixtures alike. Integrated System Technologies (IST) Ltd. are global pioneers in the design and manufacture of world leading, intelligent iDrive® LED drivers and Serenity® LED lighting solutions for commercial, office, architectural, retail, entertainment, outdoor, amenity and domestic white light and RGB-W/A applications.